Work originally invented by Professor Harald Haas and his colleagues has been showcased by major industry at the IEEE International Conference on Communications (ICC) between 21-25 May 2017 in Paris. At the flagship communications conference, Professor Haas' spatial modulation techniques were demonstrated by the mobile technology company Orange. They were billed as part of Orange's future 5G services, as a major showcase of these techniques in industry. "As consumers, we use ever-more wireless data when we access the internet, share pictures on social media platforms, and download videos on our mobile devices, or when we see the world through augment reality and virtual reality enabled glasses. Technology companies are therefore constantly seeking ways to improve the speed and the amount of data that can be transmitted while reducing complexity, cost and energy consumption of new wireless systems." "Spatial modulation techniques have the potential to vastly transform the quantity and speed at which our devices can send and receive data by simplifying the process and reducing the costs and energy involved. Spatial modulation can be applied to radio frequency (RF) systems, but also to VLC (visible light communication) and LiFi (light fidelity) wireless networks." At present, MIMO (Multiple Input Multiple Output) transmissions are used by operators to increase the amount of data by using a number of antennas in both a handset and the base station. The antennas are used simultaneously to transmit data, however this process results in interference between the parallel data streams and very computationally complex algorithms are needed to mitigate the detrimental effects of interference. Consequently, the energy consumption and cost of these systems remains high. Spatial modulation simplifies this process by only transmitting from one of the multiple antennas at a time, with the data stream choosing which antenna to use. This results in huge savings in implementation complexity, cost and energy consumption while still enabling higher data rates. Spatial modulation can therefore be used on a much larger scale and range including the next wave of machine-type communication (MTC) and internet-of-things (IoT) applications. Researchers have been adopting and enhancing Professor Haas' spatial modulation technique since it was invented eleven years ago. Professor Haas patented the technology and has since collaborated with Samsung who are also proposing the use of it for their own 5G trials. At the ICC conference, Professor Harald Haas and Zhe Cheng also won the TAOS Best Paper Award. Their paper, titled 'Physical layer Security for Optical Attocell Networks' for the first time quantified the gains of secure data transmission in LiFi small cell networks. Specifically, it showed that physical layer security in LiFi can be 20 times greater than in WiFi (wireless fidelity). 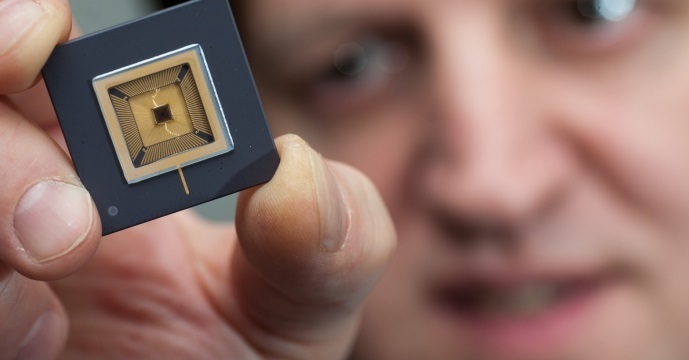 LiFi is a wireless networking technology first demonstrated by Professor Haas at TED Global in 2011. LiFi is commercialised by pureLiFi Ltd who recently won the 'Cool Tech Award' at Mobile World Congress in Barcelona.